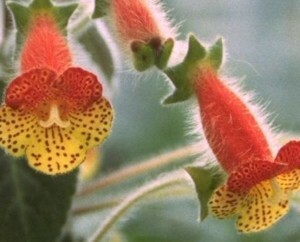 Kohleria is a New World genus of the flowering plant family Gesneriaceae. The plants are generally tropical herbs or subshrubs with velvety stems and foliage. The brightly colored flowers have spots or markings in contrasting colors. They are rhizomatous and usually include a period of dormancy in their growth cycle. The genus was systematically revised by Kvist & Skog (1992) and was recognized as having 19 species distributed in Central and South America. Recent phylogenetic work by Roalson et al. (2005) indicated that the epiphytic genus Capanea is derived from within Kohleria, so the two species of Capanea were subsequently transferred to Kohleria. The genus Pearcea is closely related. Because of their colorful and exotically patterned flowers, as well as general interest in the many tropical flowering plants being introduced from the Americas, Kohlerias were very popular in England and Europe in the 19th Century. Many species and hybrids were lavishly illustrated in horticultural magazines such as Curtis’s Botanical Magazine under the discarded or erroneous names of Achimenes, Gesneria, Isoloma, Sciadocalyx, and Tydaea. These species and hybrids almost entirely disappeared in the early 20th Century, and plant breeders have only recently started to work extensively with this genus again. Several species are widespread, variable, weedy, and tend to hybridize in the wild, and numerous names have been described that are synonyms of other species, or are hybrid material.